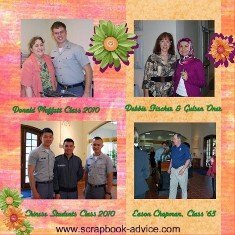 Here are some ideas for Retirement Scrapbook Layouts. These layouts were for a lady who retired from work so I decided to make all the pages follow the same theme, and it turned out to be something that matched her outfit. I tried to coordinate the layouts papers and background with some common theme in the photos - her peach blouse and flowered dress underneath. All of the Layouts with the Orange/Pink Background were done with Digital Scrapbooking using the Heritage Makers System. 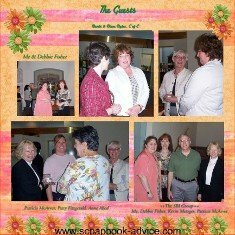 This made assembling the layouts much faster as I only had to crop the photos and move the same embellishments from page to page. I did not have to plan ahead with my purchases as they were just copied from one layout to another. Normally, I would have used the school colors, which were Blue and White, but the colors just did not work for the majority of the photos. 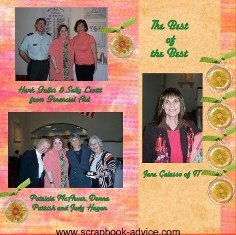 Scrapbook Advice Tip: If you are doing Retirement Scrapbook Layouts for a company or business, you might want to use the company colors or logo on each of the pages. 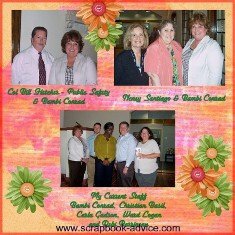 Scrapbook Advice Tip: Color is the first point with these types of photos - follow the colors in the majority of the photos as was done here. 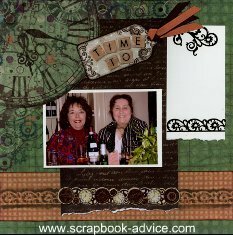 Scrapbook Advice Tip: These pages were done in sort of a Chronological Order. These first layouts show the main features of the event, and the most important guests. All background papers used were two papers I found in the Premier version of the Heritage Makers system. Some were "cut" or "cropped" into strips, corners, & ribbons to make the backgrounds different for each set of 2 layouts. I found these by searching for the Colors Peach and Orange in the system. All journaling was done in the Dark Lime Green, and the font and format of the journaling with a 2 point shadow was copied from one page to to be consistent through out. This also saved a lot of time trying to re-reformat each journaling box separately - a nice feature of the Heritage Makers System. The flowers were found in the embellishments section where I found the papers and were part of the collection. These were copied and dropped in and sized at various sizes, some were layered on top when I wanted them to cover the edges of the photos. 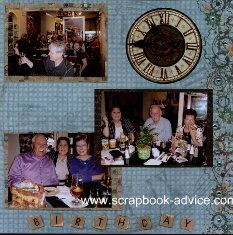 Scrapbook Advice Tip: This next set of Retirement Scrapbook Layouts focuses on the Presentation of the Retirement Certificate and Gifts. This next set of layouts used the same background papers and flower embellishments, but this time I incorporated the glass pebble charms which were layered on top of the small flowers, then I added a green ribbon bow to the top of each charm. Again, these were all found in the same collection of scrapbook items and copied. The charms and flowers were all aligned on the outsides of the layouts, using an alignment tool found in the Heritage Makers system. 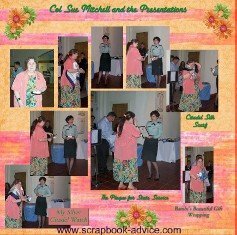 Scrapbook Advice Tip: Most Retirement Ceremonies or Parties have a speech or two and if I am going to do a scrapbook layout for these, I like to try to get a copy of the speech. Several that I have been to actually had a poem about the individual and I always put a copy of that on one page by itself. Are you helping out with that Retirement function? Check out a friend of mine for getting that Special Speech underway for your event. You may need her advice, even if you are the Retiree - don't be surprised if you are called on to say at least a few words. 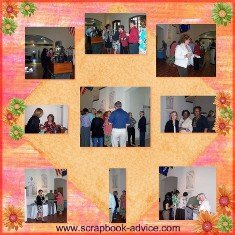 Scrapbook Advice Tip: If there are no speeches, try to capture some of the stories about the Retiree and what they did as an employee and how long they did it. 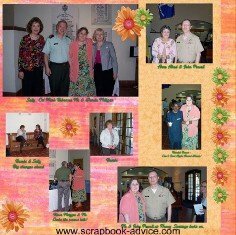 These next two Retirement Scrapbook Layouts, use the line of flowers along the bottom of the right side page, again using the copy and alignment tool found in the Heritage Makers system. Aside from cropping my photos into many different sizes. 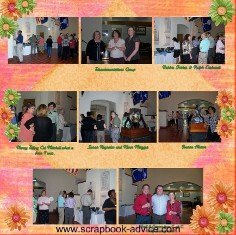 I also layered 2 photos on the left side page over other photos - something else that can be done using this Heritage Makers system. Since I used a mosaic type layout style on the left page, I was able to use both the alignment tool and a bring up a grid ruler to make the spaces between each photo the same. These next two layouts use a shorter line of flowers on the outsides of the layouts - again aligned using the alignment tool found in the basic Heritage Makers system. For the second page, the group of flowers was copied together and pasted into the new location. For this layout, I also aligned photos cut or cropped into various sizes to get a larger number of photos on the pages. 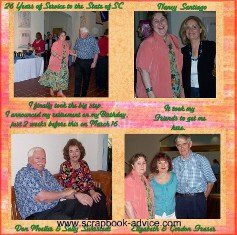 In these last two Digital Scrapbooking Retirement Scrapbook Layouts, I have turned the orange paper on a diagonal for both layouts, so this proves that digital scrapbooking can be very versatile. 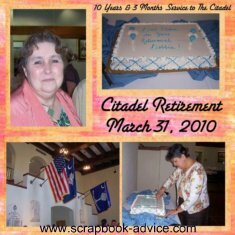 Everything on these Retirement Scrapbook Layouts was from the Personal Shopper Kit for January 2011 - the paper, the lettering, the aqua nail heads added to the border image and the layered clock embellishments from a sheet called Rustic Clocks 3-D Papier Tole Die Cuts. I must say they are awesome and fun to put together with pop dots. The Background paper was a very subtle clock face with the gears forming a border. The paper had a little more Blue than I wanted and I also wanted to enhance the numbers on the clock face to make sure they could be seen once I put the photos on. 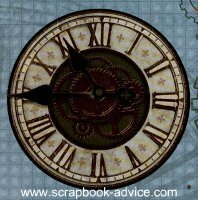 So I used some Scrapbooking Chalk called Metallic Cream Chalks in a mix of Blue and Green, and the little alligator clip tool and cotton bud to enhance the numbers on the clock face. The letters that look like scrabble tiles, were on a printed sheet. I cut them out with scissors, a put a coat of Clear Ranger Glossy Accents and attached them to the layout after they dried for several hours. 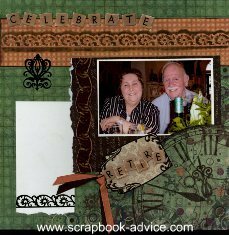 These two Retirement Scrapbook Layouts have used a Brown Metallic Cream Chalk (shown below) and a Dazzles strip to accent the orange border. 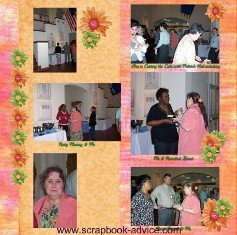 To find out how I did this, check out our Scrapbooking Chalk. Most items from these Retirement Scrapbook Layouts were from the Personal Shopper Kit for January 2011 - the paper, the lettering, the Black Dazzles, the Tags and the strip of layered clock embellishments from their Rustic Clocks 3-D Papier Tole Die Cuts that adds a very interesting dimension to the border. 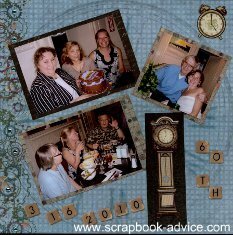 Scrapbook-Advice.com Tip: Scrapbooking anything that is date related like a Birthday, Anniversary, Retirement, or just some older photos are always easy to do if you have any scrapbook products with clock related images. There are many of these available, from paper, stamps, cut outs, and even these neat Paper Tole items. Below are some close ups of the Clock items. Another Clock related embellishment and a close up of the Chalking Embellishment. 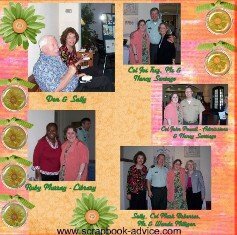 Check out the other Retirement Scrapbook Layouts #2 for more ideas.